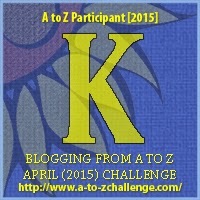 K is for Kayak | Ooh Something Shiny! I spotted my first kayak of the season today. It’s a more telling sign of spring to me than crocuses. We’ve been avid kayakers for quite a few years. We rented one year and bought a couple at a tent sale the following year. We try to go most weekends, mostly local flat water. There are plenty of local tributaries to choose from. We go mostly for the exercise, quiet and wildlife. We regularly see turtles, ducks and blue heron. On occasion there are mink and foxes. Can’t wait till its warm enough to get back out there. ← G is for GOOOOOAAAAAALLLLLSSSS! This looks like the last entry you’ve made for the A to Z Challenge. Did you want to continue, or should we take you off the list?